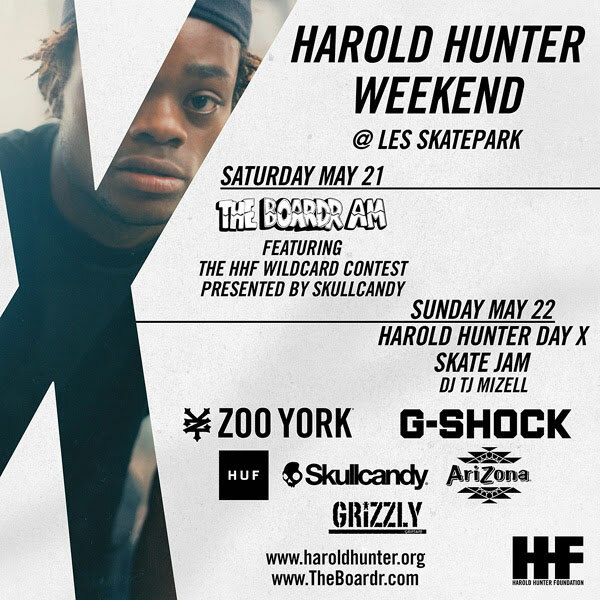 NEW YORK, NY – April 21, 2016 – The Harold Hunter Foundation, in association with primary sponsors Zoo York, G-Shock, HUF, AriZona Beverages, Skullcandy, and Grizzly Griptape, is proud to announce Harold Hunter Day X will take place Saturday, May 21st and Sunday, May 22nd at New York City’s Coleman Oval/LES Skatepark located under the Manhattan Bridge. Established in 2006 after Harold’s untimely passing, and managed by the non-profit Harold Hunter Foundation (HHF), Harold Hunter Day X will once again unite the tight-knit skate community in a celebration of everything Harold loved most—skateboarding, music, friends, family, and New York City. Traditionally only a one-day affair, this year the festivities will be significantly amplified in recognition of the event’s tenth anniversary milestone. It will truly be an entire weekend dedicated to the life and times of the late, great Harold Hunter. Brand-new this year is an exciting partnership with The Boardr Am, a renowned international contest series for top amateur skateboarders in which the winner of each stop receives an all-expenses paid trip to compete in the Finals at the Summer X Games in Austin, TX, this June. The NYC stop will take place on Saturday, May 21st from 11am-5pm at the Coleman Oval/LES Skatepark. Included in this stop of The Boardr Am will be the first-ever HHF Wildcard Contest presented by Skullcandy. Open to 20 local skaters, the top placing competitor will receive the same X Games trip as the overall contest winner. In addition, the HHF Wildcard Contest champ will receive a spot on Skullcandy’s new nolabel program. For more information and to register to compete in The Boardr Am, please visit theboardr.com. In addition to The Boardr Am-sanctioned contest on Saturday, Harold Hunter Day X will also feature an all-ages skate jam on Sunday, May 22nd from Noon-5pm, with appearances by local legends and top pros. Throughout the day, a variety of best trick contests will be held on various skatepark obstacles with cash and prizes generously provided by event sponsors. Live music will be served up by acclaimed DJ, producer and lifelong skateboarder, TJ Mizell; son of the late Jam Master Jay of Run DMC. At the conclusion of the event, a massive product toss will take place featuring free skateboard decks, headphones, t-shirts, hats, and much more. Additional activities slated for Harold Hunter Day X weekend include a special “Skate Industry 101” panel discussion hosted by Ryan Clements and 5boro Skateboards founder Steve Rodriguez. The informational session, which will take place on Friday night, May 20th at City Lore in the East Village, is a unique opportunity for the amateur skaters competing in the HHF Wildcard Contest to learn about the ins and outs of working in the skate industry from a panel of esteemed veterans. As a registered 501(c)(3) non-profit organization, the Harold Hunter Foundation relies on financial support from the skate community and related outlets to achieve its mission of using skateboarding as a vehicle to provide inner-city youth with valuable life experiences that nurture individual creativity, resourcefulness, and the development of life skills. If you would like to personally support the Harold Hunter Foundation through a tax-deductible donation, please click here. Harold Hunter Day X is made possible through generous support from the aforementioned sponsors, as well as the collective New York City skateboarding community. For more information on Harold Hunter Day X and the Foundation, please visit www.haroldhunter.org, or follow all the action on Instagram, Facebook and Twitter.